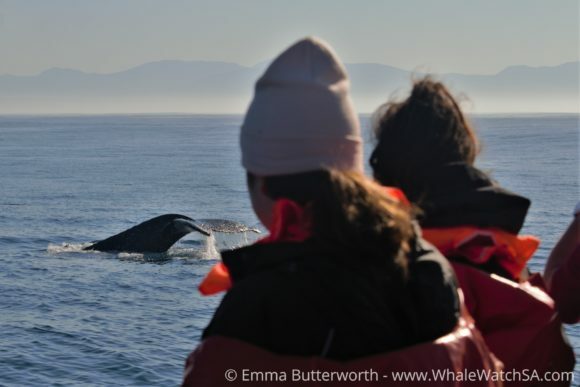 Another beautiful day filled with wonderful whales! We had two trips again today and the beautiful weather has stuck with us to give us another day of sun, whales, and calm water! 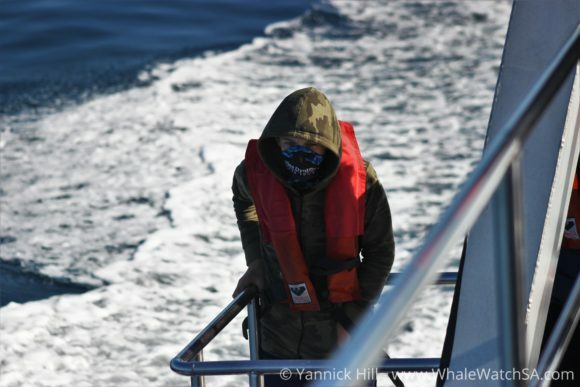 On our first trip we started the search for animals with a gorgeous sighting of a Humpback Whale. 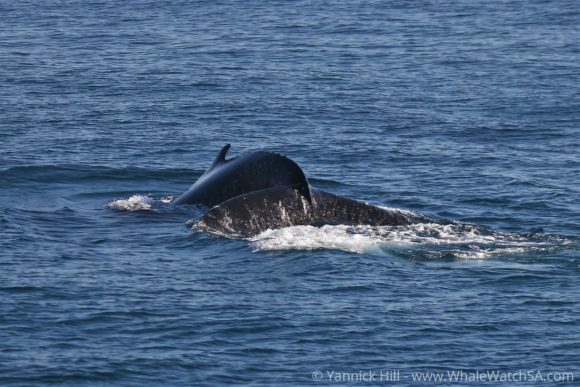 This was a relaxed yet active whale which gave us amazing views and also showed us it’s tail many times! 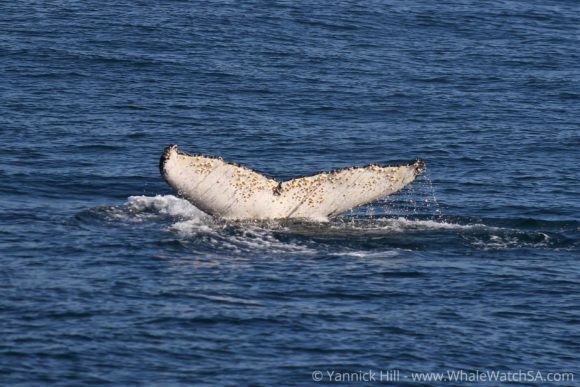 Few sites are as iconic as the Humpback Whale fluke and each animal has an unique pattern on the underside of their tail, much like human finger prints. This pattern is used to identify individuals of the species. 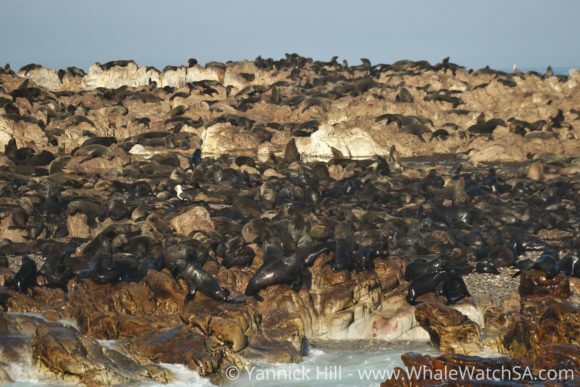 We also visited our island ecosystem to see the 60,000 strong colony of Cape Fur Seals. The colony resides on Geyser rock which is separated from Dyer Island by a narrow stretch of water called Shark Alley. 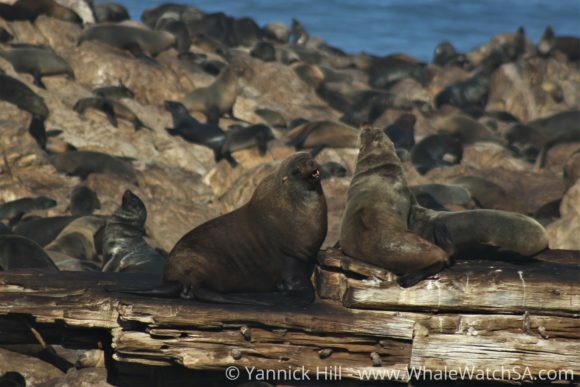 This is famous for having Great White Sharks pass through it to predate on the seals, which are their favourite food. The sharks are attracted to Dyer Island and Geyser Rock due to a natural chum slick which the Island produces. This is a scent trail, which is taken miles out into the ocean by the current, attracts sharks from all over the area to the island. 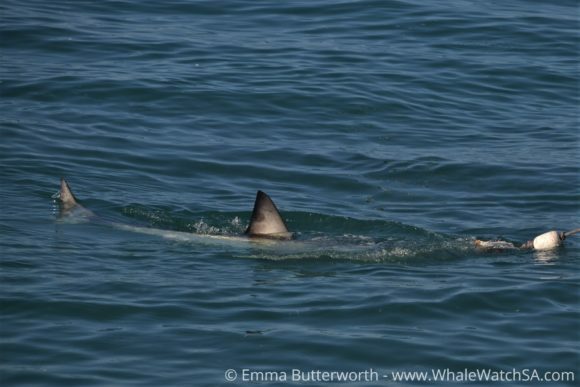 We also had brief views of two of our other Marine Big 5 species, the African Penguin sitting on Dyer Island and a Great White Shark at the cage diving site. 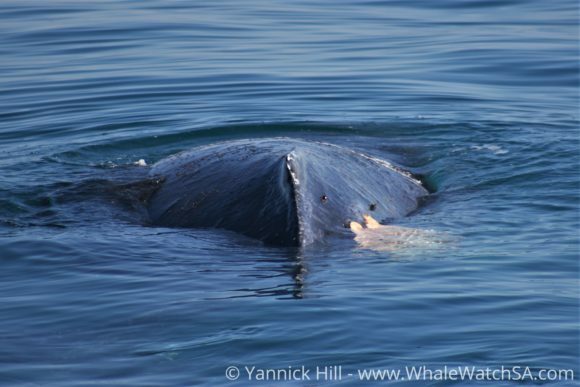 On our second trip we also started with a Humpback however this seemed to have an injury which is unusual. 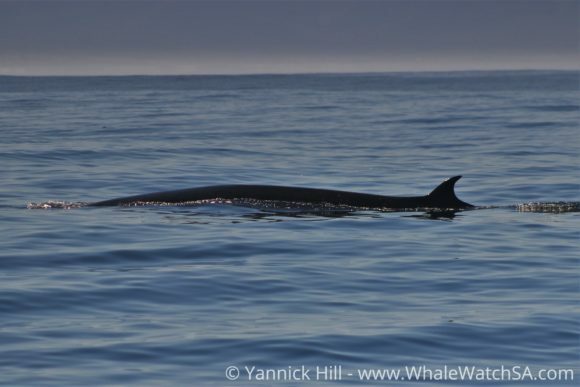 We were lucky enough to see two species of whale on this trip though as we then spotted a Bryde’s Whale. 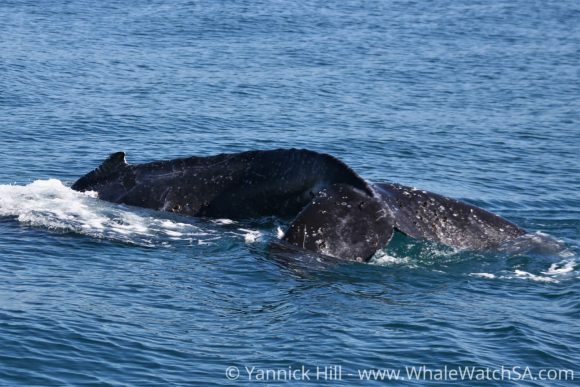 This species is not often seen at this time of year as it is relatively shy compared to the charismatic Humpbacks or Southern Right Whales, so this made our sighting all the more special! 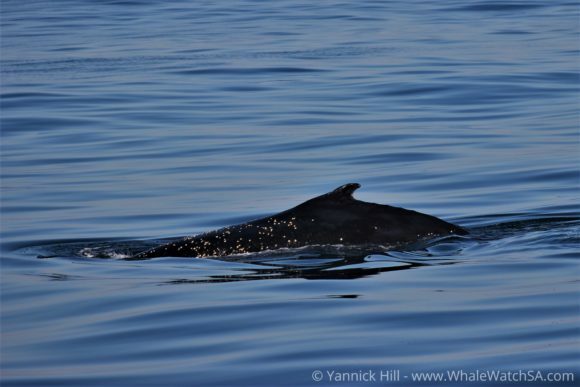 Unlike Humpback Whales, you almost never see the tail of the Bryde’s Whales as they don’t lift it out of the water to dive deeper. On our stop at Shark Alley and Geyser Rock this trip we noticed a seal that was caught in fishing net. There were various attempts to catch and free the seal from the netting but unfortunately it retreated into the mass of seals so we lost it today. Hopefully we may be able to free it soon. We were also lucky enough to see the powerful Great White Shark at our cage diving vessel, Slashfin. There were numerous passes made so this made a great end to our trip! 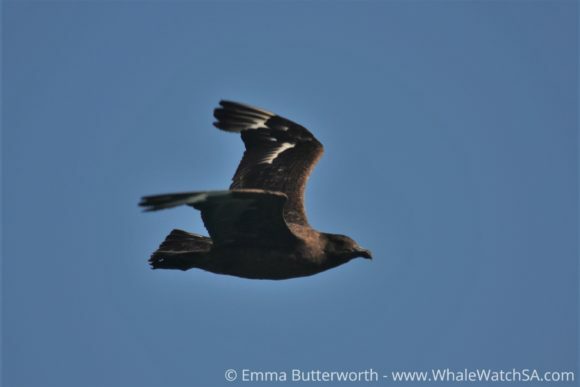 As a side note, we had many Subantarctic Skuas around today. 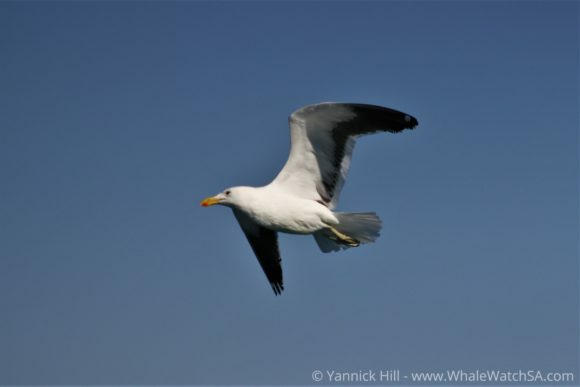 This is the large brown, gull-like bird that flew around the boat numerous times.